Tilia europaea produces a wonderful pleached Lime tree, with heart-shaped green foliage turning buttery yellow in autumn. Small pale-yellow flowers provide additional interest. Pleached Lime is a great option for providing dense coverage as it matures, well suited to creating screening, privacy or shade where desired. 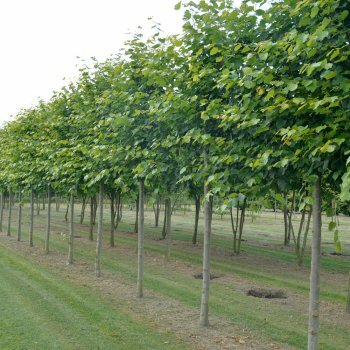 Pleached Lime trees are the perfect choice for instant impact and ours have been carefully trained by leading experts over a number of years. Sometimes known as stilt hedging or hedging in the sky, you may have seen fantastic specimens of pleached trees at Hidcote Manor in Gloucestershire or Harley Hall in Cheshire. Our containerised Pleached trees are available year-round, unlike rootball forms. Please call our Sales and Service team on 01943 660870 to discuss requirements. When planting pleached Lime trees, prepare the planting area by removing all weeds and grass within a metre of your desired planting hole. Dig a square hole as deep as your root mass and approximately 2x as wide. To help the tree establish more effectively, sprinkle root grow in the hole. It is a two person job (minimum) to place the rootball in the hole. Then, using 50% of the original soil and 50% compost, fill in the hole and firm around gently. Avoid banking it up around the collar of the tree. We recommend planting pleached trees with a large stake and tie kit - instructions are in the planting guide. Formative pruning has already been carefully and expertly carried out on all our pleached trees. You will just need to carry out maintenance pruning going forwards. This involves pruning to maintain the shape of the tree and also removing any diseased or damaged branches. The bamboo frame that comes on the tree can be cut off when the pleached tree is mature enough. So, if Clear stem = 2m and Head = 1.5m x 1.2m then the total height will be 3.2m and total width 1.5m.